Arkansas jewelry designer Bang-Up Betty on the set of KATV with some of her handmade jewelry. Bang-Up Betty made the news this week! 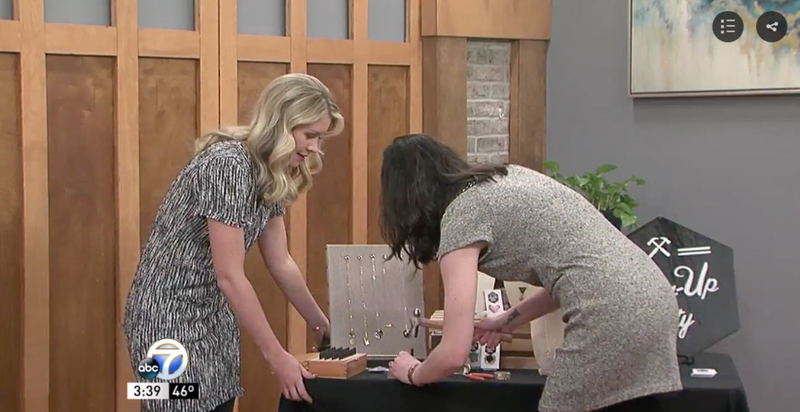 Monday, I brought my tools and an array of designs to KATV's Good Afternoon Arkansas to talk shop and teach Elicia Dover how to stamp jewelry and about my line of Arkansas made jewelry. I chat about where I get my inspiration, how I learned how to make jewelry and some of my favorite designs. Click here to watch the video! Plant Lady, I'll Cut You, Hot Mess.. a few necklaces by Arkansas jewelry designer Bang-Up Betty. Arkansas jewelry designer Stacey Bowers of Bang-Up Betty demonstrates how she makes handmade stamped jewelry.